I really enjoy eating out – and not just because it saves me from doing dishes! I love good, quality food, great conversations with people and fun new atmospheres. With kids, work, budgets and such, though, I don’t get out nearly as often as I’d like. Luckily, when I do there’s some excellent options – and right now I’m enjoying the Fresh Eats at Zoës Kitchen! Plus I’ve got a promo for some goodies for you – so check it out! 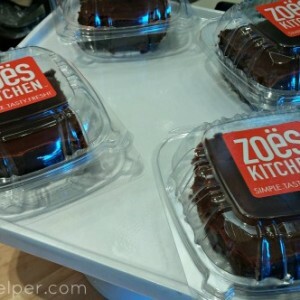 To be honest, I wasn’t sure what to expect from Zoës Kitchen when I first went – Mediterranean food often covers a wide variety of things, from my experience. And yes, their menu is extensive, so there’s a large variety for anyone’s preferences! Hubby and I snuck on a lunch date here, and ordered several different things because it all sounded so delish. I was really happy that the food was so fresh – from the crisp salads and veggies, to the sweet fruits, even the meats were amazing. Of everything we ordered, there wasn’t a single item I didn’t truly enjoy! And you HAVE to try their in-house lemonade – seriously it’s SOOOO good! You can take the food to go, but it’s way fun to eat in their colorfully decorated restaurant, too. Of all the yummy-ness, I’ve gotta say that I couldn’t get enough of their pita bread with hummus! And guess what? YOU can get free Hummus & Pita during your next visit to Zoës Kitchen! How you ask? Well…. You will have 14 days to redeem this offer from the day you enter “goodness” into the app. December 31st is the last day to enter the code into the app. Find your nearest Zoës Kitchen HERE and enjoy a delish and FRESH meal! I love cooking meals for my family, I really do – but sometimes there’s just not enough time in the day. While certain things on our never-ending To-Do list can wait until later (you’d be proud how well I can postpone laundry), feeding your family a quality meal just isn’t one of those! Luckily, KFC has the ideal meal to feed your kiddos, family and friends. So Give Yourself a Break with the KFC Family Fill-Up! 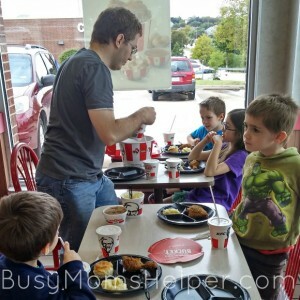 My family LOVES KFC – I even worked there in high school, until I moved away for college! You know it’s good, quality food when you can work around it for years and not be sick of it 🙂 Since we’ve still got plenty of boxes to unpack from our move, paperwork for switching addresses, typical work and school stuff, we decided last weekend was the perfect time for our family to take a little break and enjoy the delish Family Fill Up, some time away from the hassle, and great family conversation! Yup, for just $20 (plus tax) we got 8 pieces of chicken, 2 orders of mashed potatoes and gravy, 1 order of coleslaw and 4 biscuits. I’ll admit I’m a fan of the crispy chicken, but most of my family prefers the original. Either way, it’s so yummy and brings back plenty of happy memories! The Colonel once said that “It makes me feel good that my food has helped make life a little easier for people” – and what makes life easier than taking care of mealtime for your family? And not just any random fast-food meal, but actual fresh, delicious choices that please everyone, just like a home cooked meal – but without all that time and hassle! Not sure where your closest KFC is? Just check it out HERE to find one near you – then give yourself a break from cooking dinner tonight and let your family enjoy a fresh KFC Family Fill Up meal!